If your order weighs less than 13 ounces, save huge on shipping with USPS first class (with tracking number). This product weighs 1.4 oz. 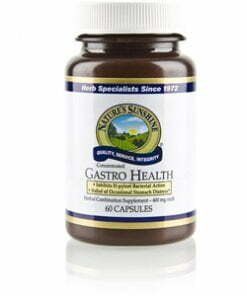 Nature’s Sunshine Gastro Health soothes stress, strain, and discomfort in the stomach. A result of two years of intensive research, Nature’s Sunshine combines several key herbs in the Gastro Health formula to assist in fighting the H. pylori bacteria, a bacteria that has been found to cause ulcers. Deglycyrrhizinated licorice extract (DGLE), one ingredient in the formula, alleviates stomach discomfort. 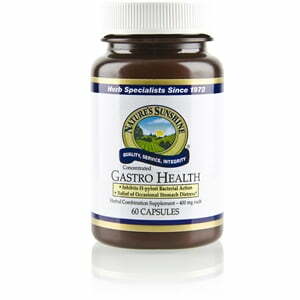 Pau d’arco bark extract, clove flower powder extract, inula racemosa root extract, and capsicum fruit are also included in Gastro Health. Instructions: Take two capsules with a meal twice daily, plus two capsules at bedtime with a glass of water. Cellulose (plant fiber), lecithin (from soy), kosher gelatin, and water.